Remember when the major criticism leveled against the Atari ST series of computers stemmed around the apparent lack of software? The range of programs currently available to ST users is now quite exceptional. Programs covering everything from spreadsheets to adventure games, databases to utilities, are numerous in both the public domain and commercial areas. One of the few weak areas, however, concerns software designed for preschool children. Fortunately, this need was recognized and is in the process of being filled by D.A. Brumleve, who has written a wide range of educational games and fun exercises for children. This month I offer two of my five-year-old's favorites from her catalog. Offered to the four-to ten-year-old range, Makin' Aiken is an interactive song that allows the child to build a silly picture of Aiken, the man in the moon, from a choice of fruits and vegetables. When in my preschool years, Mr. Potato Head was a game all of my friends owned. Now Kidpotato, a similar game, is available on the ST, and you don't even need to crawl under the couch in search of that lost ear. Note: The programs described in this article are available on this month's disk version, as well as on BBSs and commercial online services throughout the country. Offered to the four to ten-year-old range, Makin' Aiken is an interactive song that allows the child to build a silly picture of Aiken, the man in the moon, from a choice of fruits and vegetables. The program is based on the children's song, "There was a man lived in the moon." 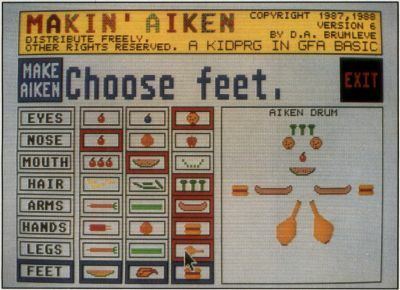 The object of the program is to choose food from a picture row of edibles that will represent the eight body parts of Aiken: his eyes, nose, mouth, hair, arms, hands, legs and feet. As each choice is made, the selection is displayed on the right side of the screen as the chorus of the song is played. For instance, if the picture of cherries is selected for Aiken's hair, the cherries are drawn in the box labeled AIKEN DRUM where his hair should be. As the song is played, the words are printed in large type so that the child can sing along ("His hair was made of cherries, cherries. His hair was made of cherries, and his name was Aiken Drum"). Selections are registered by clicking the mouse on the appropriate choice. My five-year-old had no trouble playing with this program, although I did need to do some coaching to get him to sing the song. Fun for the little ones, Makin' Aiken should be kept on your games disk. When in my preschool years, Mr. Potato Head was a game all of my friends owned. Several years ago the game was reintroduced and once again gained a degree of popularity. Now Kidpotato, a similar game, is available on the ST, and you don't even need to crawl under the couch in search of that lost ear. 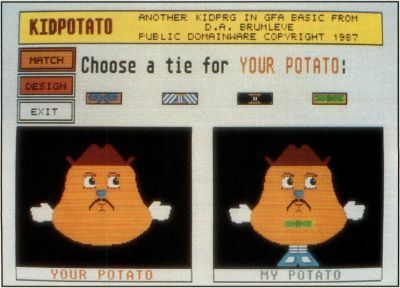 The Kidpotato screen is divided into two major sections: the left portion of the screen labeled YOUR POTATO and the right portion labeled MY POTATO. A choice of MATCH or DESIGN determines the direction of the program, whether the object will be to match an existing potato or design a new one. If the MATCH option is chosen, a potato in the MY POTATO section is drawn with a randomly chosen hat, eyes, nose, mouth, tie and shoes. The object of this game is for the child to match each of these objects. One at a time, a selection of four types is offered. For instance, the first object to be matched is the potato's hat. Four hats are placed within buttons at the top of the screen. The mouse is then used to determine which hat was chosen on the MY POTATO side. A correct choice displays WOW on the screen and happy musical tones are played while drawing that part of the potato on the MY POTATO side. An incorrect guess honks at the user and prompts him to TRY AGAIN. After the correct hat has been chosen, the selection process continues with the eyes, the nose and so on. When all of the choices have been completed the potato waves his hand. The other option, DESIGN, allows the child to design his/her own potato. This section of the program is similar to the above, with the exception that the child designs the potato by choosing the parts from a picture menu. One attribute at a time, the choices of hat, eyes, nose, etc., are made until the potato is complete. Remember when the major criticism leveled against the Atari ST series of computers stemmed around the apparent lack of software? This program is excellent for the two-to six-year-old who can tolerate only a minimum of frustration—a key concern for this age group. The play allows simple and fun interaction with the computer for even the youngest child. I hope your children enjoy the two programs on this month's disk as much as mine. Additional programs from D.A. 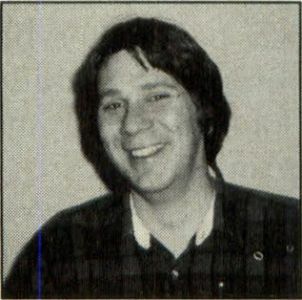 Brumleve can be found on DELPHI, GEnie, CompuServe, your local bulletin board and each month in ST-LOG as part of the Compukid Connection column.